Bob Martin Flea Clear 3 pipettes are effective for up to 24 weeks flea protection (8 weeks per pipette) for dogs. 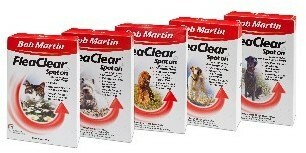 Bob Martin Flea Clear is safe to use in households with both dogs and cats. Bob Martin Flea Clear Spot on for Dogs is a low cost and effective flea treatment for dogs and puppies over the age of two months. Available in 1,2 and 3 pipette packs, using the same active ingredient as Frontline.